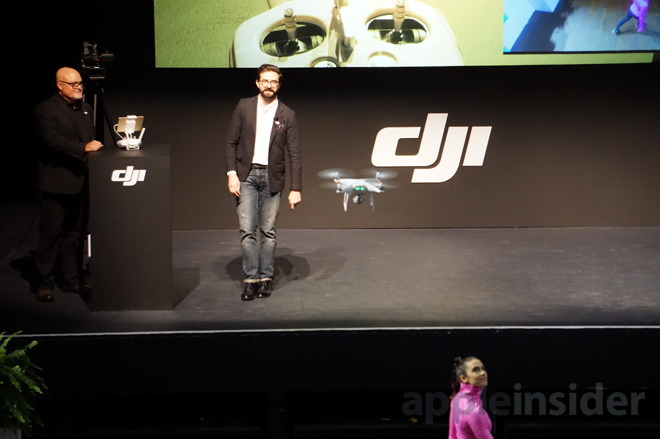 DJI held a media event in Manhattan on Tuesday to unveil the next-generation Phantom, priced at $1,399 and launching exclusively through the company and Apple this month. 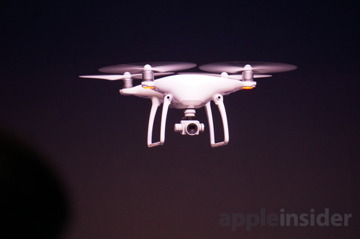 AppleInsider was there for the presentation, which included an obstacle course, of sorts, intended to showcase the autopilot, auto-follow and object avoidance capabilities of the Phantom 4. To allow more room to show off the Phantom 4 in flight, attendees were located on the second floor balcony section of Terminal 5, a New York venue usually used for concerts. Looking down at the stage from above, DJI gave the typical keynote requisites, including a video presentation of gorgeous aerial footage shot from around the world on the new Phantom 4. But the most interesting part of the demo was when a Phantom 4 took flight within the venue itself. It's important to note that there was no GPS signal available within the building, meaning the drone's live autopilot demonstration was said to be done entirely with the device's onboard sensors —including two cameras up front for obstacle avoidance, and two ultrasonic sensors underneath for positioning. 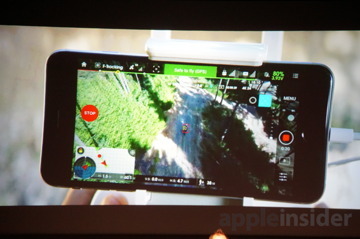 On the ground floor, a woman playing the role of a jogger came out for the presentation, while a pilot selected her as the subject via DJI's iPad app. The Phantom 4 took flight and followed the jogger around, while other participants attempted to thwart the Phantom 4 with distractions and obstacles. DJI's tight integration with Apple devices plays a key role in the autopilot and auto-follow capabilities of the Phantom 4. Watching a live feed from the drone, users can select a subject with their fingertips on an iPhone or iPad, highlighting whatever they want the Phantom to automatically film and follow. In fact, the new autopilot modes make it possible to take off, fly and film with the Phantom 4 using an iPhone or iPad entirely, without even touching the thumbsticks on the drone's physical controller. In the live demonstration, the jogger was followed around the venue while the Phantom 4 avoided signs and objects that were waved in front of it. Other people also moved around, such as a man doing laps on roller skates, simulating the kinds of real-world distractions that could potentially confuse the Phantom 4's auto-follow mode. In this demonstration, everything worked seamlessly. While the live flight focused on a person, prerecorded footage also showed larger subjects —including a rowboat full of people —being followed and filmed with breathtaking aerial footage. DJI also pulled back the curtain on their promotional video by bringing to the stage its creative director, Sheldon Schwartz, who shot the footage featured in the keynote. 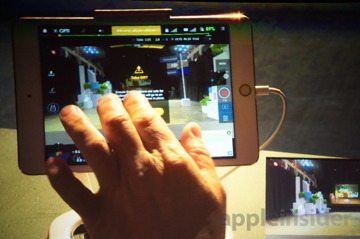 Schwartz was accompanied by behind-the-scenes footage that showed using an Apple iPad to control the Phantom 4 and view live footage on location. In one clip, Schwartz showed how the Phantom 4 on autopilot was following a biker down a mountainside. At some point, the drone encountered a large tree and didn't have a safe way to avoid it. The Phantom 4 simply stopped and hovered in place, avoiding a potentially costly crash. A new "sport" mode also allows the Phantom 4 to travel at up to 45 miles per hour. This was showcased with downhill longboarders who were automatically followed and breakneck speeds. Of course, it remains to be seen how well the Phantom 4's obstacle avoidance, autopilot and auto-follow capabilities will work in real-life daily use. But at $1,399, it's nice to know that your pricey new toy is smarter than ever, and will automatically take steps on its own to prevent a high-cost accident. Preorders for the Phantom 4 are underway now ahead of a March 15 launch. 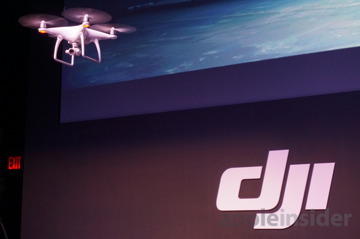 The device will be exclusive to DJI and Apple retail stores for this month's launch.